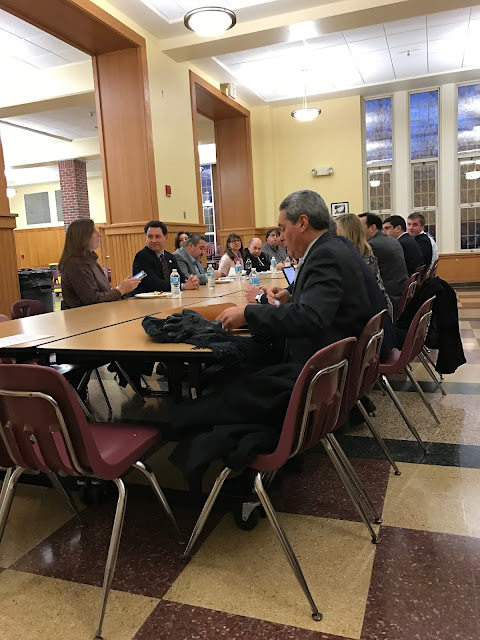 Here below are pictures of the meeting that took place in the School Cafeteria on Brewster Road last night Monday March 6th. The first picture is a picture of both Boards sitting around the table. The second picture is a picture of residents and other interested parties attending. I was not sure of a lady in the audience, I am not sure if she is a resident or a journalist. She left in a hurry before I could ask. Bob Harrison, Robert Berg, Mayra, Ron Schulhof, B.K. Mungia were the residents I could identify. 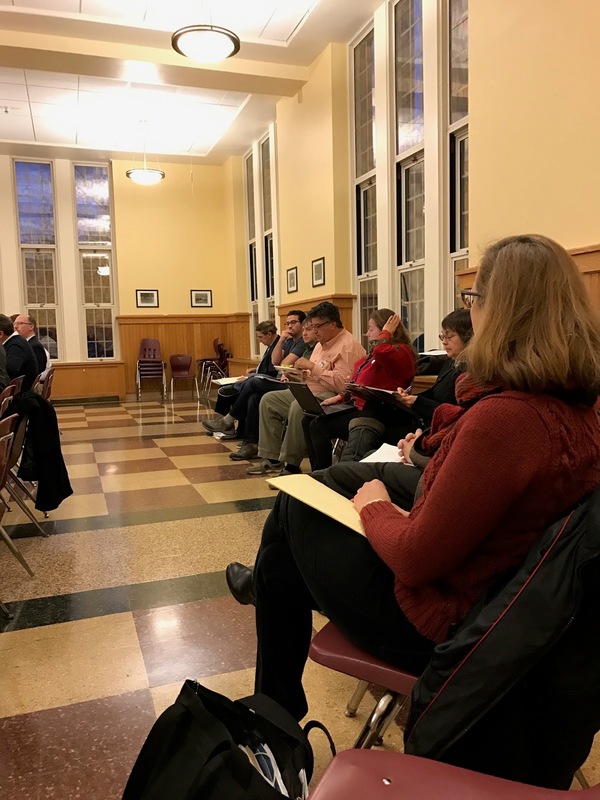 Items on the agenda from the SVAC response to school bus accidents to the Scarsdale Teen Center to projected decrease in tax revenue were discussed. The Scarsdale Volunteer Ambulance Corps responds to an accident on a school bus. They "own" the kids as David Raizen put it when they respond. So, he wanted to know if they could release the kids to their families...Since they are all under 18, they have to decide for them or wait for a parent to show up. This is an important matter as you can imagine. David said he has written to McGill in 2013 and to the new Super intending and now he has come before the Board with his plea for a plan. The Board has yet to decide and come up with a plan. There was no plan, no discussion that I heard of last night. From the Village Board, Trustee Bill Stern was very much for continuing to fund the Teen Center while Trustee Matt Callaghan was on the other end of the spectrum. A member of the School Board considered the discussion useless, since they have data indicating poor usage. Over budgeted and under utilized was a term heard. Our Village Manager, Steve Pappalardo briefed the School Board on the status of tax grievances, since these have a direct impact on the School Budget. Less assessed value, means less tax revenue for the Village as well as the School. The School Budget is $150 Mil., whereas the Village Budget is $55 Mil. The School Budget serves about 4,500 students. The Village serves a population of 17,605. The Village total debt about $ 23 Mil., debt service $ 1.9 Mil. More figures about total debt and debt service to be posted here as I get them from the School Board. First revision 4:47 p.m. Tuesday March7, 2017.